I usually just add some grill seasoning, garlic, salt and pepper and it good to go, but I was feeling a little gourmet the other day and decided to go all out and add some other healthy goodies. How can you go wrong with fresh baby spinach, sun-dried tomatoes, olives, garlic, and cheese? Judging by these burgers... YOU CAN'T! Cover a baking sheet with non-stick foil or spray foil lined sheet with cooking spray. Heat broiler on low and adjust oven rack to top. Blend together turkey, spinach, olives, sun-dried tomatoes, Italian seasoning, cheese and salt and pepper in a large bowl. Do not over mix. Form mixture into 6 equal size patties, free form or with a burger form. Broil burgers about 5 minutes on first side and about 4 minutes on second. 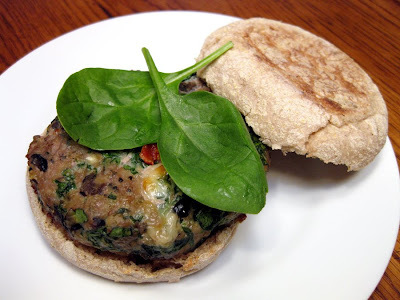 (An instant-read thermometer inserted in the center should register at 170º F.) Transfer burgers to muffins and top with extra spinach leaves if desired. Top with ketchup or mayonnaise. This sounds fabulous, a great way to make turkey tasty!! :) Warm weather always gets me craving burgers! Yum! Never put olives in my turkey burgers but now I will try it. I love turkey burgers, in fact, I just stocked up on ground turkey! I definitely need to try this one. Yummy! That burger look so good! A great flavor combo! Great burgers for summer time! I love turkey burgers! This one looks awesome. I'm absolutely smitten with it. My husband loves turkey burgers, so thanks for a delicious recipe! You never know what a turkey burger is until you try this recipe ,delicious bambola.